And another very happy new year to everyone, hoping this next one will have a little more rain in summer (preferably at night!) and be a little cooler. Doorbell rang in the evening and there was the next door neighbour with a jiffybag of Topper shallots from Marshalls and some freebie seeds. First delivery of 2004 - yippee. I found it amusing that the shallots were a lot smaller than the ones I received last year - so they had a bad season too! The freebies were Romaine lettuces - well I´ll definitely grow those, and now I´ve got the cloche bottles, I can try and force them too. Watch this space... The other freebies were my choice - a packet of carnations. Strike one on the flower plot. Dad's ordering me dahlias (full height) so that's two. Dunno what else to get, though I've got all the miniature sunflowers from last year that I never planted. Think an allotment border of those will look cute. Have the first lousy cold of the season, and found it a good excuse to clean out some pots with Jeyes fluid as I can´t actually smell the stuff! Rinsed them out well and them planted up the new shallots together with the Jermor ones I have had for a while. Evicted some of the Jermors that were already growing. It´s funny that the ones that are sprouting are the ones I bought, while the (bigger) and still solid ones I saved from the last crop are still happily dormant. Not for long, I hope. Shoved them outside into the rain. I ordered two bags of onions this year so it´s to be hoped I manage to get another plot... or I´ll be totally stuffed as to where to grow them on! Much nicer day than we've had for a while - yesterday started frosty and went dull - today stayed clear. 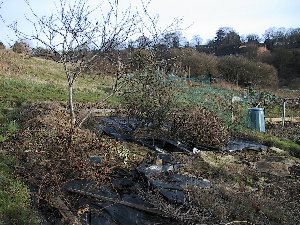 Out to allotment as soon as I figured it was thawed out enough for planting, and took up the remaining garlic at last. Way too many cloves, so gave a few to Vince. They had grown out through the holes in the modules and needed unplaiting before I could get them out! Counted: 77 now planted and growing, Marco, Cristo and Thermidrome. Then, armed with the secateurs and few layers of fleece, went and attacked the bramble. The stakes have had it (bashed on in for the time being, another snapped) and so left the two clumps of bramble twined together to keep them out of the apple tree. Picked the largest Savoy cabbage and found it wasn't worth the effort, sadly. Picked one of the remaining summer minicoles and found they were, as last year. The leeks are now getting to a reasonable size at last so pulled one. Inspected the orchard - have lots of bulbs poking through. Excellent! Went to South Heath and acquired some more modules to replace the shredded ones, some vermiculite and three new fence posts with points on. Should in retrospect have bought a small mallet, but can get mid-week I expect. Much to my amazement, the cloche etc did not blow away in the gales we had a week or so ago. All in all, not looking too bad. Have half a bed left for shallots, so again, need to get some more space sorted! Yeehah! Got a letter out of the blue from the council with the tenancy agreement for the plot next to mine - so I have more room at long last! Chris and I are going to split it, however: she will have half of it instead of the brambly one up the top that she is forever fighting a battle with, and the other half is shared for flowers and overspill. I suspect I´ll have a lot of onions and potatoes interleaved with my flowers :-) but now at last I have room to expand nicely and the best bit is that the plot is mostly bare, as Julian has been keeping it tilled. I wish him and his family all the best in their new ventures. 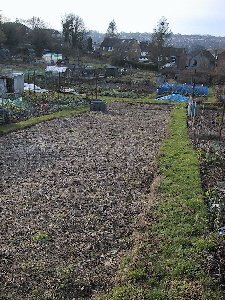 The top end - mostly carpet but with a large-ish compost heap (mostly from my plot! ), a greengage and some dessert gooseberries. Will be a swine to dig as it´s solid... but like all of the plot, it´s been fallow a while so should be good. The main plot: bare and ready to go. Does suffer badly from pink bindweed but I know if you keep digging at it, it goes. Original plot is on the right of the path. Picked up by Chris at 7.15am, and off we went up the M1 for Ryton to the potato day. Managed to blag my way in as second guest and had a great time deciding on what varieties to buy. After an initial coffee and flapjack, we went down to the potato sales marquee and found it was already a scrum. Grabbed paper bags and felt tip pens and joined in. I had a bit of an idea of what to get thanks to having spent part of the journey up in reading the Alan Romans guide, so picked up Ratte (x5), Pink Fir Apple (x5), Estima (x3, but big enough to divide up) and Accent (x5). The latter is a first early which seemed a good idea. Had a browse and also wound up with Mimi (x5) which is a red cherry sized salad potato. Then Red Duke of York (x3). Also investigated the Thompson and Morgan stall, where they were selling trial tubers of the new Czech Sárpo maincrop varieties, which are supposed to be blight resistant. Time will tell - we both got two of each kind. Two of the talks were useful for me, growing from basics, and pests and diseases. The other one was biological control, which the (marketing) guy talking had no real clue about. We skipped the cookery demo as it was what to do with crisps (!) and then had a wander about. Bought quite a few things in the shop, resisted joining (least for this year) and somewhere in the middle, had lunch in the car in a violent rainstorm. The weather was not nice, and the journey back was shaky with huge gusts. The forecast winds were worst in the south, and so it got progressively worse the further south we got. Overnight was not fun. Meanwhile, had a peculiar conversation with Paul which seemed to end in us being engaged.